Hampshire doom metal maniacs Witchsorrow are confirmed to play three UK headline shows to celebrate the release of fourth studio album, Hexenhammer. 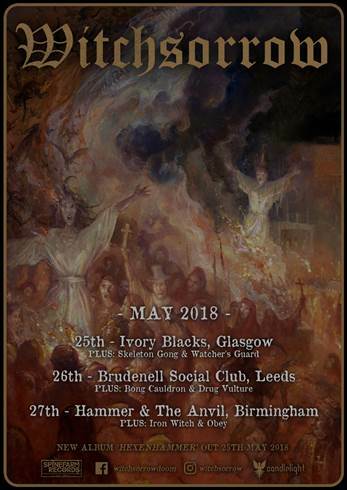 Starting in Glasgow on May 25th (album release day) Witchsorrow will then appear in Leeds & Birmingham with local bands playing in support. Guitarist and vocalist Necroskull says; "We're thrilled to mark the first strike of the Hexenhammer with these special shows. While we are immensely proud of the record, these songs were written to bang heads and crush skulls live. Join us, maniacs, at the dawn of your own doom." Additionally, WS are now confirmed to play Doomline Festival in Sheffield on July 23rd. Recorded at Skyhammer studio in Cheshire with long-time co-conspirator Chris Fielding (Conan, Primordial, Electric Wizard), and mastered at the legendary Orgone studios by Jaime ‘Gomez’ Arellano (Ghost, Paradise Lost), Hexenhammer finds WS continuing to explore the darker corners of doom, illuminating them with the blinding light of sheer heavy metal forged of the strongest steel. It’s an almost anthemic soundtrack to the end of the world lyrics.